Best Winter Photography Gloves - Heat 3 | Jobu Design | Cool Photography Gear "
Email us at coolphotographygear@gmail.com to be first in line and reserve your glove system today. Smart Just Got SMARTER. Introducing the Heat3 Layer System designed for photographers by photographers. We solicited feedback from hundreds of photographers using the current Heat3 Smart glove to find out how we could improve it. We got tons of great feedback and that’s what allowed The Heat Company to create the Heat3 Layer System, a revolutionary concept in photography gloves. YOU ASKED FOR IT, YOU GOT IT!!! The new Heat3 Layer System now gives you the flexibility to build the perfect glove/mitten system for all shooting conditions from cold to extreme cold. The outer shell no longer has the liner built in, it is simply a shell. And now you have your choice of three removable liners to wear inside the shell. Each liner varies in thickness from warm, warmer to warmest giving you the flexibility to build out the glove as warm as you need it to be for the conditions you’ll be shooting in. Then there are the little tweaks that just make the glove more useable for photographers. 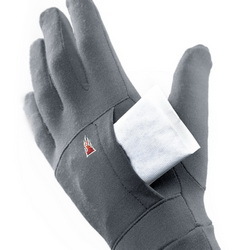 Each of the three liners has a pouch for hand warmers on the back of the hand so the warmth of the warmer is closer to your hand when you require it on colder days. 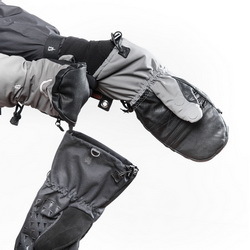 The liner, the shell and the hood all have attachment points so the system stays bundled together and the tether strap holds all three pieces to your wrist so no piece drops in to the snow by accident. We want to thank everyone who shared their feedback with us and helping to create what we believe is truly the next evolution in photography gloves. Click Heat 3 under "Products" to see the very best in quality winter gloves. Cool Photography Gear prides itself in bringing only top quality products to the photography market. This is why we brought Jobu Design into your lineup. Jobu Design is a Canadian company that manufactures 100 percent of their products in Canada. What does this mean? It means they are made Canadian tough, and able to take the heat of our summers and the cold of our winters and work perfectly. Jobu Design gimbal heads are designed to balance your camera and lens at their natural centre of gravity which makes the load virtually weightless. This makes panning moving wildlife effortless and without the worry of your camera and lens falling to one side or the other as can happen with a ballhead mounting system with larger lenses. There are countless articles from professionals around the world stating that the investment in a good solid tripod is one of the most over-looked purchases amateur photographers make. Jobu Design has answered that call with the introduction of the Killarney and Algonquin line of carbon fibre tripods that offers two heights and either one is perfectly suited for mounting any of Jobu Design gimbal heads. Click Jobu under "Products" to see the very best in quality tripods, gimbals and camera plates. Cool Photography Gear is pleased to announce we have added BlackRapid camera straps to our product line up. BlackRapid has set the standard for camera slings since 2008. Founder/ CEO Ron Henry invented a system in which the camera hangs upside down by its tripod mount. When ready to shoot, the camera can easily glide up the webbing into position and then be placed back down at the photographer’s side, hands-free. BlackRapid combines the comfort of a well-made shoulder pad with the convenience of a highly functional sling system. Click BlackRapid under "Products" to see the very best in quality Camera Straps.